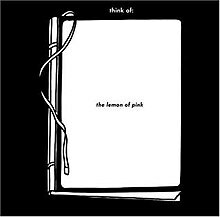 The Lemon of Pink is the second album by American musical duo The Books, released October 7, 2003 on the Tomlab record label. Like much of The Books' other work, The Lemon of Pink incorporates sampled elements juxtaposed with folk and string instrumentation and other melodic elements, including guest vocals by Anne Doerner on the first track, "The Lemon of Pink". Initial critical response to The Lemon of Pink was very positive. At Metacritic, which assigns a normalized rating out of 100 to reviews from mainstream critics, the album has received an average score of 86, based on 9 reviews. Daphne Carr of AllMusic wrote that "It isn't often that one finds an American artist with such a mastery of collage technique and a desire to incorporate traditional folk instruments and melodies. Like the Notwist or Badly Drawn Boy, the Books open up territory for relaxed electro-acoustic listening without compromising their creative process." Comparing The Lemon of Pink to its predecessor Thought for Food, Mark Richardson of Pitchfork stated that several tracks on The Lemon of Pink "are even better than their forebears, with more dynamic range and a greater sense of development", and the record as a whole "may sound a bit like this duo's debut, but it also sounds like nobody else." Alternative Press hailed The Lemon of Pink as "the rare sort of album that convinces you original music still exists". Andy Battaglia of The A.V. Club wrote that while "some of the exposed-seam splicing sounds sloppy and/or twee", The Books "wield a solid musical hand over melodic figures that hint at swooning grandeur without falling prey to florid temptation". The Village Voice's Robert Christgau gave the album a three-star honorable mention, indicating "an enjoyable effort consumers attuned to its overriding aesthetic or individual vision may well treasure", and described it as "ambient musique concrète out of acoustic instruments, fractured song structures, and talky voices". Pitchfork named The Lemon of Pink the second best album of 2003 on their year-end list, as well as placing it at number 20 on their list of the top 100 albums of 2000–2004. ^ Macdonald, Cameron. "Lost and Safe with The Books". Tape Op. Retrieved October 3, 2016. ^ a b c Carr, Daphne. "The Lemon of Pink – The Books". AllMusic. Retrieved January 2, 2016. ^ a b "Reviews for The Lemon Of Pink by The Books". Metacritic. Retrieved March 19, 2009. ^ a b "The Books: The Lemon of Pink". Alternative Press (186): 110. January 2004. ^ a b Richardson, Mark (November 4, 2003). "The Books: The Lemon of Pink". Pitchfork. Retrieved September 8, 2012. ^ "The Books: The Lemon of Pink". Q (209): 120. December 2003. ^ Battaglia, Andy (December 16, 2003). "The Books: The Lemon Of Pink". The A.V. Club. Retrieved January 2, 2016. ^ Christgau, Robert. "Key to Icons". RobertChristgau.com. Retrieved January 2, 2016. ^ Christgau, Robert. "The Books: The Lemon of Pink". RobertChristgau.com. Retrieved January 2, 2016. ^ "Top 50 Albums of 2003". Pitchfork. December 31, 2003. Retrieved June 6, 2016. ^ "The Top 100 Albums of 2000–04". Pitchfork. February 7, 2005. Retrieved June 6, 2016. This 2000s indietronica album-related article is a stub. You can help Wikipedia by expanding it. This page was last edited on 22 March 2019, at 19:06 (UTC).